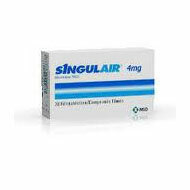 Singulair (Montelukast) is used for the treatment of asthma and seasonal allergic rhinitis. Singulair is used for prevention and long-term treatment of asthma. It is also used in certain patients to relieve runny nose caused by allergy and to prevent asthma attacks caused by exercise. It may also be used for other conditions as determined by your doctor. Use Singulair as directed by your doctor. Check the label on the medicine for exact dosing instructions. Check the label on the medicine for exact dosing instructions. An extra patient leaflet is available with Singulair . Talk to your pharmacist if you have questions about this information. Take Singulair by mouth with or without food. If you miss a dose of Singulair , take it as soon as possible. If it is almost time for your next dose, skip the missed dose and go back to your regular dosing schedule. Do not take 2 doses at once. Singulair is a leukotriene receptor antagonist. It works by blocking a substance called leukotriene, which helps to decrease certain asthma and allergy symptoms. Tablets should be stored at room temperature, 15-30 degrees C (59-86 degrees F).